The final beta release of Rings of Valor is here, and with it the Achievements. There are only 20 of them but how to unlock them is a secret. They're not impossible and all of them should eventually come up when playing the three game modes, though it took few hours for me to unlock them all even with knowing how to. I tried to avoid "false" achievements such as "Launched the Game" or "Played 100 Quick Matches". Some are harder, and some need more luck than others and might require a multitude of matches before the RNG decides to favor you. 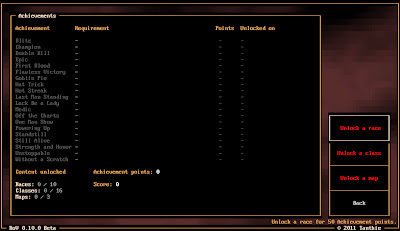 All the races and classes are in; 10 of the races and 16 of the classes can be unlocked with achievement points. There are also three new maps -- also unlockable. To do this you, need to move the statistics.vsf into the profile folder before launching the game for the first time. The statistics file will be deleted and added into the new profile.vsf that will be created once the game is launched. 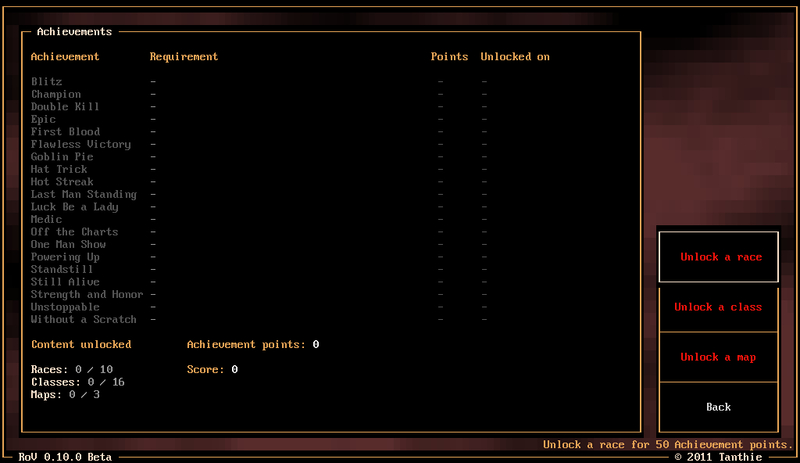 Couple achievements could technically be unlocked with the data of the old statistics file but I decided against it. You can also use the old .ini file if you so desire. All the originally intended features are now in the game, and next release -- v1.0.0 -- will only have some interface improvements (such as hotkeys for menu items and such) and race/class balance tweaks added in (feedback and suggestion welcome again). And some other things that might come up. Also, I had the game crash once when starting a Quick Match but I haven't been able to reproduce it. This might lead to a loss of the Tournament and Ladder saves as the save files are deleted when you first time click the Play button in the main menu and saved then only after you exit the game. I will move the deletion/saving to when actually playing the tournament/ladder for the next version. But so that you know. Humm, what else... Yes, there should be more target changing by the AI gladiators, partly because the defender passive abilities now have a tendency to make the target hate you. Have been playing since yesterday, haven't run into any crashes. Really loving the unlockable classes. Barbarian, Runepriest and Invoker especially are SO good/fun. Have you tried giving everyone 2 ability points at the start of ladder mode? Casters especially have an awkward time with only 1 skill for the first...20-30 matches? The "Oh god I'm a caster and these three melees won't stop chasing me for the love of god" problem seems to be fixed. It's still there at times (and it should be), yet it's nowhere near as horrid as it used to be. Do Ultimate skills have any hit modifiers? It's somewhat excruciating to miss a Barbarian Execute (or a Wizard Nova). You've really made an addictive game. Thanks for sharing it. Awesome game mate, although I would have to agree with the comment from Holsety though. Its pretty tough starting out as a caster without having your 2nd ability to help you out. Also Shamans are a little over powered in my opinion, the reason is because purge has no cast time and is a range spell which allows you to kite enemies for entire games. Yeah, not sure what I was thinking with Purge. I shall put it back in line with the other ranged attacks. And evidently I forgot to do anything to the problem with casters lacking utility in early Ladder. I think starting at level 2 will work just perfectly. But I'm glad to hear you like the game otherwise. Loving the Defender ´taunting´. Makes me feel very useful pulling aggro off my teammates. Is it absolute taunting as long as the debuff is active? For example, I beat ladder playing as a Goliath Battlemind with an Invoker and a Warlock. First level consisted of some very close matches (mostly defeats). Once I hit second level I took Mind Spike, didn't lose a single match afterwards. Not too long after that the damage output from the Invoker and Warlock started ramping up and things got insane. Both of them had around 12.000+ damage dealt per match (around 40 seconds). After hitting first rank my team had a nice 2-4 level advantage on the enemy teams and I could just start the match and not touch the keyboard for 40 seconds while I and W clean house. Near the last 10% of the season the enemy teams caught up to us in level, and their damage output increased too. Suddenly found myself having to get in there and Defend again, this was very fun. Not sure what to do against this though. It really adds to the Defender FEEL. You could make it so enemies that are being taunted (ie they're not originally out to get the Defender) go back to attacking their original target once their original target hits them with an ability? The achievement was appropriately large, though. Now that I've unlocked all classes and races it's time to look at all the fun combinations (and try to unlock those maps, haha). I like how the feel/difficulty/strategies needed changes for each different mode. Personally I like Tournament best, though they're all good.